All IamResponding subscriptions include FREE iOS (Apple) and Android™ apps for all members of the subscribing entity. For entities that process their dispatch notifications through IamResponding, members can receive supplemental notifications of their dispatches via push notifications through the apps. This provides a great supplement to traditional pagers when notifying members of incident dispatches. From the simple to use apps, members can indicate whether, when and where they are responding to any incident, and can easily see who else is responding. 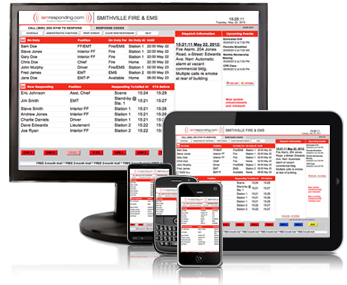 Duty rosters, the ability to modify schedules, the ability to do all of your department’s mass messaging, and your department's events calendar are all included within the apps. IamResponding’s apps are also 100% integrated with Google Maps™. Dispatches are easily mapped, with turn-by-turn directions to incident scenes, and turn-by-turn voice navigation is also provided. You can also map and easily view all of your hydrants and other water sources, as well as 40+ additional map markers, with detailed information. When members indicate that they are responding from their apps, all of IamResponding's mapping systems can also be set to display the responding members' live location, so you always know how far away they are from your station or scene. Of course, if a department or member does not want this feature, users can also simply turn it off. **If you are a current IamResponding subscriber, and your dispatches are NOT currently being processed through your IamResponding system, please contact our customer support team today to set up this feature, at no additional cost.